This pretty pendant was inspired by something personal: Mom’s roach clip. Form, meet function. 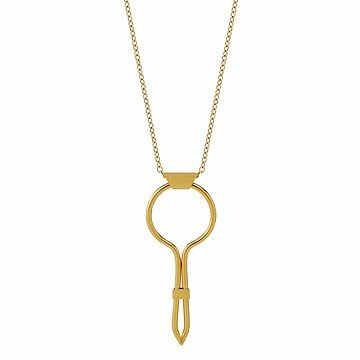 Jeweler and metalsmith Erin Rose Gardner's sleek, pretty pendant was inspired by the roaring '20s, the bohemian '60s, and something more personal: Mom's roach clip. "As a child I thought this thing was a toy," Erin says. (Her mom stored the disused tool—designed to keep smokers from burning their fingers on the last of a joint—lodged in a potted plant's soil for posterity.) "When my parents separated, my mom forgot her roach clip in the plant, so I took it. I lost it within four hours and never told her." Shaped by hand with a hammer and anvil, this working gold-plated necklace is Erin's way of bringing the tiny token back to life. Handmade in Portland, Oregon. Erin Rose Gardner is a Portland, Oregon based studio artist whose practice undulates between craft and design; focusing on jewelry as both the format and subject of her work. She makes objects that are informed by ideas and research, and is always searching for meaning through material culture. Gardner studied metalsmithing and jewelry at the University of Oregon and upon graduation she was awarded a Windgate Fellowship, honoring the work of the best emerging graduates across the United States. The award allowed her to research mass-production in Guangdong Province in China, continuing her examination of craft, production, and sentimental objects. Today, Gardner's work is part of the permanent collection of the Newark Museum, Newark, New Jersey and has been exhibited internationally, including Galerie Rob Koudijs, Amsterdam; The Custard Factory Gallery, Birmingham, England; Talents at Tendence, Frankfurt, Germany; Sienna Gallery, Lenox, Massachusetts; Houston Center for Contemporary Craft, Houston, Texas; Gallery Loupe, Montclair, New Jersey; Norton Museum of Fine Art, West Palm Beach, Florida; and Miami University Art Museum, Oxford, Ohio. She was a recipient of a 2010 Individual Artist Fellowship from the Oregon Arts Commission. Visit the Blog to get the full story on Erin Rose Gardner's elegant jewelry with an interesting function. This is a classy and stylish necklace which also makes a political statement if you live in a 'no cannabis' state. I'll be ordering one for myself after the holidays. I wore this product 2 days, and on the second day the chain broke - not near the clasp, but a few links down from it. I anticipate that my 57 year old wife will retire in three years and will be going to Burning Man for the first time then....accompanied by our then 28 year old daughter. This item is perfectly suited for that adventure. I was looking for a present for my best friend's 40th birthday. She's incredibly stylish and classy so i wanted something that fit her personality and also connected our deep and enduring friendship. The Mary Jane's necklace did just that. Its a beautiful piece she can wear tat is simple and elegant and yet reminds her of the fun times we have shared. It's a beautiful necklace! I'm obsessed with the 20's and I love that this necklace is a throw-back to that era and lifestyle of flapper. The metal used for the necklace and is well-made and the gold finish came out beautifully. The only thing though is that I noticed the sides of the pin were slightly scratched from the clasp used to pinch the pins together.